DPS was developed in Microsoft Visual Basic and makes use of a Microsoft Access® database. DPS can be run on Windows 95, 98, 2000 and NT and requires at least a 120 Mhz Pentium with 16 Mb free memory. Additionally Internet Explorer 4® has to be installed. DPS consists of a authoring program, in which tutors can make new cases and a student program to play existing cases. 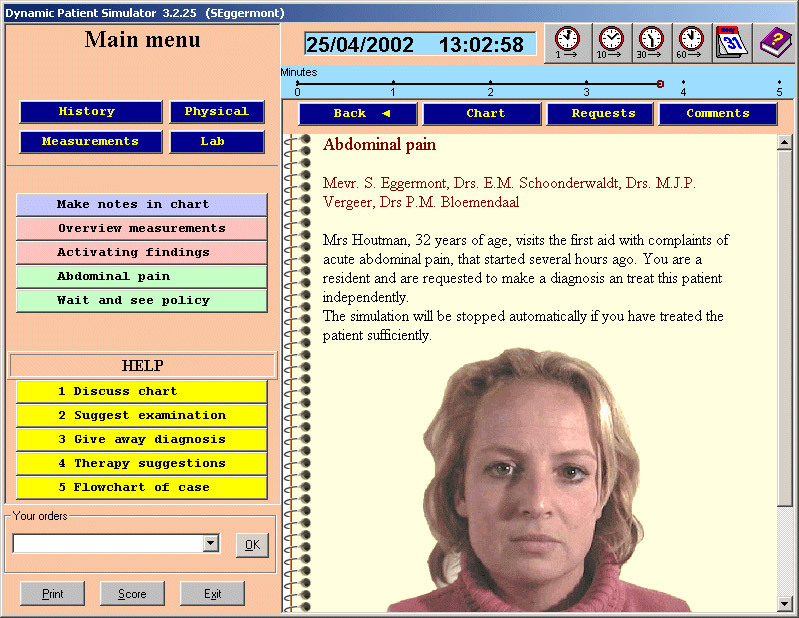 At the start of a case within the student program a student is presented with the patient chart at the right side of the screen. During the course of a case al the information that becomes available is added to this chart. This information can consist of text, pictures, movies and sounds. Instructions to the program can be submitted by preprogrammed buttons or through free text submission. At any point in a simulation the student can ask for assistance from the build-in electronic teacher. At the top of the screen the simulation time is always running and can be sped up if necessary.